The Queen descended from her carriage. She was weak, but erect. The close heat of the night and her sleeplessness and her fatigue had caused great beads of sweat to stand upon her forehead. Up river along the quays there had already showed, as she crossed the bridge on to the Island of the Cité, a faint glimmer of dawn, but here in the courtyard all was still thick night. The gates of the Conciergerie opened rapidly and shut behind her. Her gaolers led the way down a long, low, and dark corridor, stiflingly close and warm, lit here and there with smoky candles. 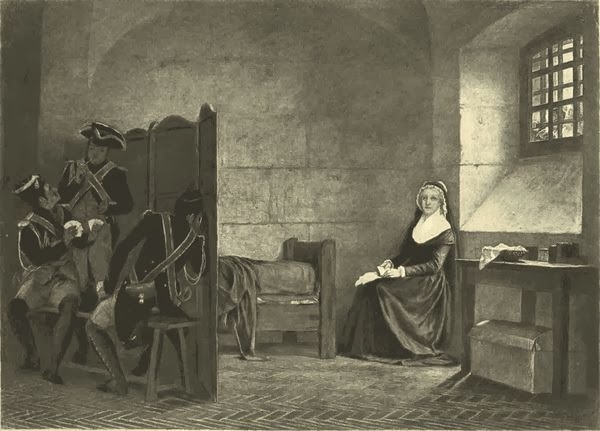 She heard the murmur of voices, and saw at the end of the passage a group of the police and of magistrates at the door of the little room that was to be her cell. 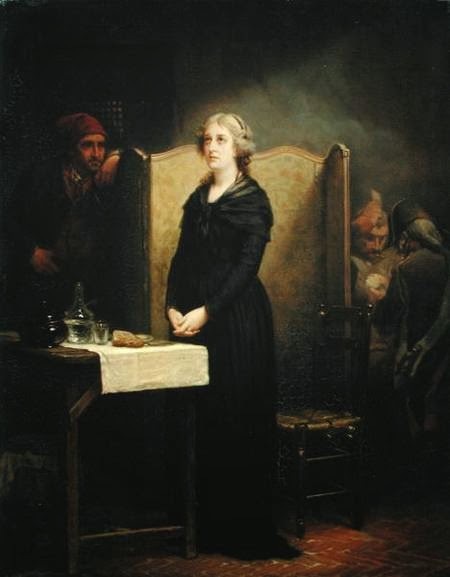 She entered through the throng, saw the official papers signed at the miserable little table, and heard the formal delivery of her person to the authorities of the prison; then they left her, and in their place came in a kindly woman, the wife of the porter, and with her a young girl, whose name she heard was Rosalie. The Queen sat down on the straw-bottomed chair and glanced round by the light of the candle beside her. It was a little low room, quite bare: damp walls, the paper of which, stamped with the royal fleur de lys, hung mildewed, rose from a yet damper floor of brick set herringbone-wise; a small camp-bed covered with the finest linen alone relieved it, and a screen some four feet high, between her and the door, afforded some little shelter. Above her a small barred window gave upon the paving of the prison yard, for the dell was half underground. 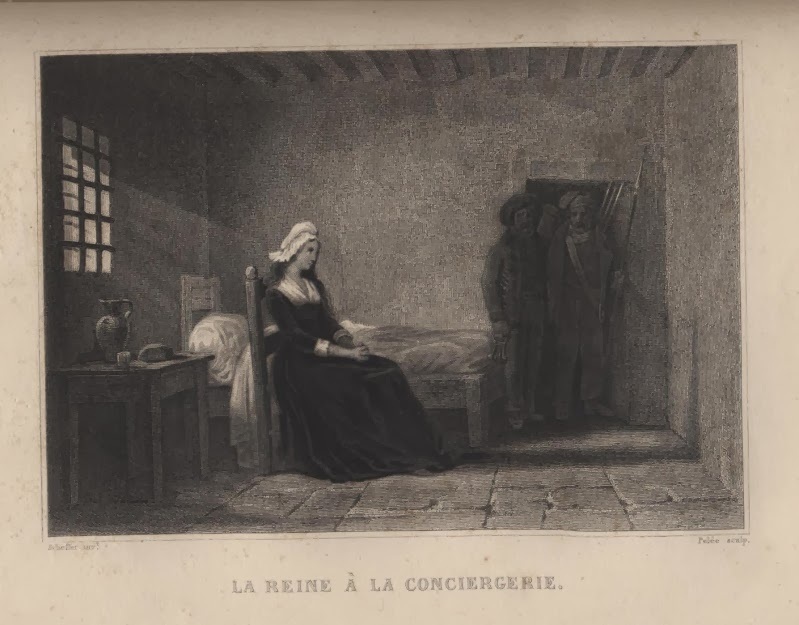 Here Custine — who had lost the North and was to be executed for the fall of Valenciennes — had been confined till his removal but a few hours before to make way for the Queen. Here is now the canteen of the prison. It was very late. The new day was quite broad and full, showing the extreme paleness of her face and her weary eyes. She stood upon a little stuff-covered hassock, hung her watch upon a nail, and began to undress, to sleep if she might sleep for a few hours. A servant of the turnkey’s, a girl called Rosalie, timidly offered her help; the Queen put her gently aside, saying: “Since I have no maid I have learnt to do all myself.” They blew their candles out and left her to repose. All day long a corporal of police and his man sat on guard in a comer of the room. All night her door, in spite of its two great bolts, was guarded. For the rest her wants were served. She asked for a special water from the neighbourhood of what had been Versailles, and she obtained it. They hired books for her. They permitted her good food and the daily expense upon it of a very wealthy woman. whose rudeness disturbed her. They would let her have no steel — not even the needles with which she was knitting for her little son, nor a knife to cut her food; but more than all there sank into her the intolerable monotony, the fixed doubt, the utter isolation which made the place a tomb. The smallest incident moved her. 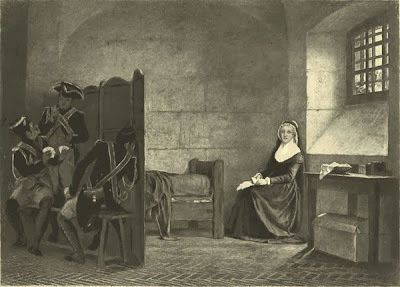 She would watch her gaolers at their picquet and note the game, she would listen to distant music, she would greet with a dreadful reminiscence of her own the porter’s little son, and cry over him a little and speak of the Dauphin — but this last scene was so vivid that at last they dared no longer bring the child. She kept for consolation all this while, hidden in her bosom, a little yellow glove of her boy’s, and in it a miniature of him and a lock of his hair.